"MADE IN THE USA" by "American workers"! 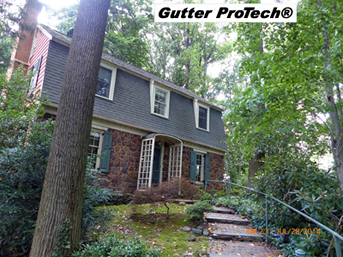 Gutter ProTech® is a rain gutter protection "panel" that can be installed over new or existing rain gutters to keep debris from entering your gutter and clogging it. Gutter ProTech® can be professionally installed with most types of roofs and rain gutters, turning them into virtually Self-Cleaning gutters™. "No one will ever again need to climb a ladder to maintain your rain gutters". Available in copper and many colors of aluminum to blend with your roof. Cleaner in 2014... after 17 years. Click either small photo to understand why. According to the National Safety Council, falls at home are the #1 cause of over 65,000 accidental deaths and almost 2,000,000 hospital related injuries reported each year in the United States. Our premium rain gutter protection system is available in copper panels and many colors of .027 inch thick aluminum panels. Our gutter guards turn once high maintenance rain gutters into very low maintenance Self-Cleaning gutters™ and if any maintenance is ever required, it can be done safely from the ground. gutter covers are professionally installed and guaranteed. Many other caps and helmet type gutter covers are nailed or screwed to your roof, but our gutter guards are attached only to your secured gutter with stainless steel screws and do not compromise the integrity or warranty of your roof. Unlike the single piece leaf guard that is a cover and gutter in one, if a tree branch falls and damages an area, one or two panels can be easily removed and replaced, as opposed to replacing the entire length of gutter. Another quality feature that differentiates Self-Cleaning gutters™ from most of the competition is our two rows of offset filtering louvers on the vertical face of our panels. Not even pine needles get inside your gutters once our Self-Cleaning™ "pine and leaf proof" covers are installed. Most of all you'll enjoy the feeling you get with Self-Cleaning gutters™ "peace of mind protection™"; knowing that you will never have to worry about cleaning your rain gutters ever again. Your home will be protected with the absolute best gutter protection you can have installed, at any price. You'll be the envy of your neighbors, friends and family, so go ahead and contact your local Self-Cleaning gutters™ dealer now for a free survey and quote.